doesn't mean that it doesn't exist! The greatest privilege we have is prayer. It is no wonder our suffering brothers and sisters ask first for our prayers to remain strong in advancing the kingdom where faith costs the most. around the world are routinely persecuted for their faith. they suffer injustice, often to the point of death. they want to ADVANCE THE KINGDOM! 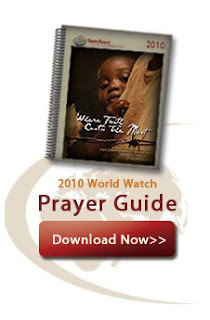 Visit the links to learn more about the 2010 Summer Offensive Projects and to download your FREE copy of the 2010 World Watch Prayer Guide. (c) Open Doors USA works in the world's most oppressive countries, strengthening Christians to stand strong in the face of persecution and equipping them to shine Christ's light in these dark places.